Synopsis: A frail young man with aspirations of serving his country during World War II is given a chance to become the superhero Captain America via a super secret programme. Review: When the world erupted in war back in 1939, countries the world over were all looking for able and strong men to sign up for their respective armies to take on and bring down the evil Nazi regime. In the case of one frail sickly young man, who was absolutely determined to sign up and fight for his country, yet his aspirations were forever getting trampled on due to his poor health. This is until, through a top secret programme, he has his chance to become a super soldier. This man is of course Steve Rogers, AKA Captain America. Back when the all powerful Marvel machine was still in its first warming up phase, director Joe Johnston with screenwriters Christopher Markus and Stephen McFeely, provide an interesting take on the back story of one of the most popular heroes of the MCU. His journey from a weak young man, to a near invincible badass though was far from an easy one, but it is very interesting to watch. Beaten up by what seems like every kid in his neighbourhood as a child, the early scenes of the film show just how down on his luck he is, with everyone including his best friend, Sergeant James Barnes AKA Bucky (Sebastian Stan), going off to war without him. Chris Evans in his second stint as a superhero, after two ill fated spells as the Human Torch in 2005 and 2007, is tremendous in the lead role. His humanity and compassion shines through, and it’s this along with his dogged determination, combined with some convincing CGI that makes him look very frail indeed. that brings him to the attention of Abraham Erskine (Stanley Tucci) the creator of the super soldier programme who fast-tracks Rogers for the programme, and for battle. Yet despite this very intriguing opening, the film suffers from pacing issues, as Cap instead of being thrown immediately into battle, is made to wait. All the while the war rages on, and the dastardly Johann Schmidt (Hugo Weaving) AKA The Red Skull of HYDRA is preparing to unleash chaos on the world in the form of a very rare off world artefact. The pacing issues persist throughout though as while there are some great action scenes for us to enjoy, a lot of scenes are put together in a montage that almost feels like the studio had blown their production budget on certain effects and were forced to cut back on the action. That being said, there are some action scenes that are just flat out awesome, including taking a zip wire onto a moving train. These scenes do make for some spectacular viewing but a bit more action, and not montaging through considerable portions of it would have been great. There are plenty of some very big names on display here, and all give great performances. Tommy Lee Jones is on fine form as a gruff US General, Hayley Atwell as the fierce but compassionate Agent Peggy Carter who has something of a soft spot for Cap, and she proved to be such a popular character that she got her own spin off series, and Cap’s best buddy, Bucky. Flying the HYDRA flag along with Herr Schmidt and Dr Arnim Zola (Toby Jones.) While both give solid performances, their accents are somewhat questionable. Yet Johnston managed to create a very gritty Superhero war movie that looks superb with great attention to detail, and he gives a character who has proved to become one of the MCU’s most popular heroes a solid introduction to the Marvel Universe and help build Marvel’s Phase 1 to an exciting climax. 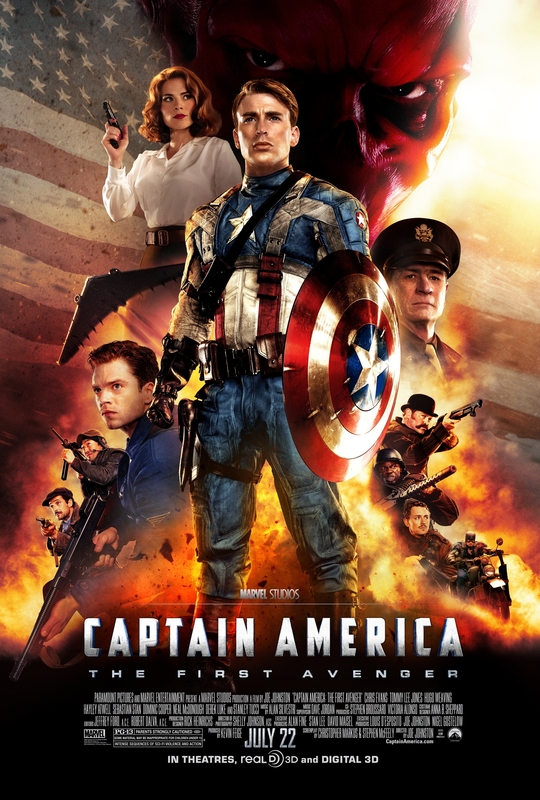 Cap gets his stars and stripes good and proper, with some solid acting and directing, but more action set pieces wouldn’t have gone astray. I thought this was OK, at best, certainly didn’t prepare for the outright brilliance of Winter Soldier. Yeah it could have been a lot more I agree, but yeah Winter Soldier definitely blew this out of the water! Very excited for Civil War!! definitely mate! Excited that they’re on board for Infinity War!